The Laguna Max Flo 7600 Pond Pump has a maximum lift height of 3.5m with a maximum flow rate of 7600 litres per hour. Thanks to its 8mm solids handling capabilities the Laguna Max Flo 7600 pump is designed to provide continuous and reliable water circulation, backed by a 3 year warranty. The Max Flo range are ideally suited for a variety of pond applications, such as providing water flow to filtration systems or creating spectacular waterfalls. Made in Italy the Laguna Max Flo Pond pumps are powered by a magnetic-driven motor that’s unrivaled in the market for generating large amounts of water flow at extremely low energy costs. 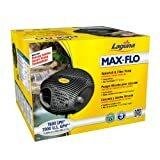 The Max Flo 7600 runs on just 75 watts which means that switching to a Laguna Max Flo Pump can often pay for itself in one season. This entry was posted in Aquatics and tagged Fountain, Garden, Laguna, MaxFlo, ponds, Power, Pump, Waterfall by One Boutique. Bookmark the permalink.